I wanted to crochet something to show my support for our country when going out to the stores and such. This is what I came up with, and I made some for my kids to wear at school too. These work up pretty quickly and you’ll only need a small amount of crochet thread. Start with the red thread and ch:31, turn and sc in each ch, fasten off. (*)Join the white thread and sc in each red ch across, ch 1 turn and sc across white, fasten off. With white thread, Ch 50. You have a strand to make the bow. 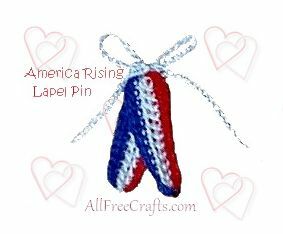 Fold your red, white and blue strip in half and pull the white strand thru the center and tie a bow tightly. That will make the ends separate a little. Glue to hook side of the safety pin. Let dry, then wear with PRIDE ! My heart goes out to all who have lost loved ones. You are in my prayers. If you live in another country, change the colors to those of your own national flag. Sports teams or youth groups could also make personal lapel pins in their club colors as well.